Skype virus has become a serious problem in the cyber space. Cyber crooks haven't stopped updating it since 2015. Skype virus is a group of malicious programs and phishing scams that have been targeting users of this widely-spread application. One of the first cyber threats was Skype worm w32/Ramex.A which was detected in 2007. However, it seems that the term “Skype virus 2018” will continue appearing in users' searches. The latest its versions are reported as Baidu virus and goo.gl virus. 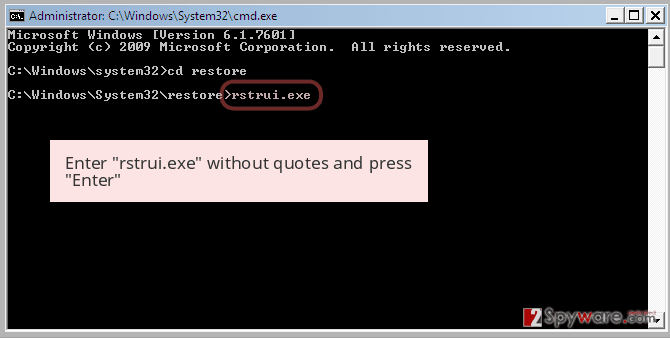 Remove shared.xml file, change your Skype password, run a full system scan with Reimage. Previously, Skype network was involved into distribution of Bitcoin-mining malware. Because of that, sometimes it is referred to as the Bitcoin virus. 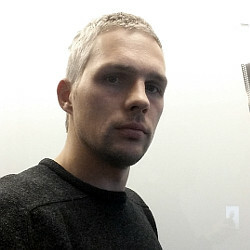 This infection is used to exploit computers' resources to generate virtual currency. As a result, the affected machine becomes slow and practically unusable. However, bitcoin mining is not the primary goal of the malware. The most popular versions of Skype malware have been designed to steal users' personal information, sensitive computer data or to distribute malicious content by sending messages telling “Hey, check this video” or “this is a very nice photo of you” that are followed by a malicious link. For instance, the Koobface virus, which has been spreading messages featuring links to “shocking” or “hilarious” videos with the user's name (or username) attached. 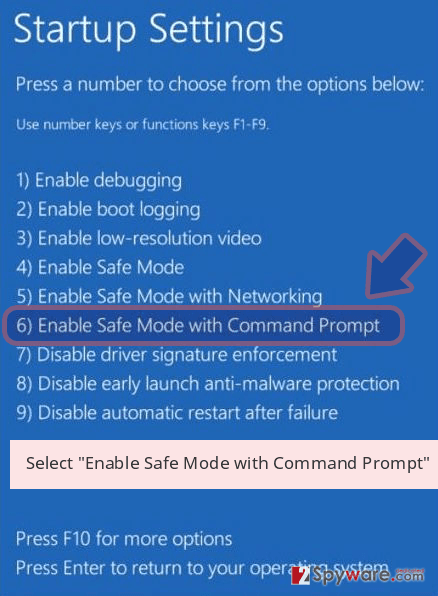 Links that are usually added to such messages are used to download and install the Koobface worm on the computer. Up until now, hackers have presented several methods used to hack users' accounts. Besides, hackers have also started connecting the affected computers to botnets which are used to spread a massive amount of spam or initiate other malicious activities. For this reason, sometimes it is difficult to attribute any specific characteristics to Skype spam virus. If you have problems with logging in to your Skype account or receive reports from your contacts that they received some shady link from you, you might suspect that your account was compromised. 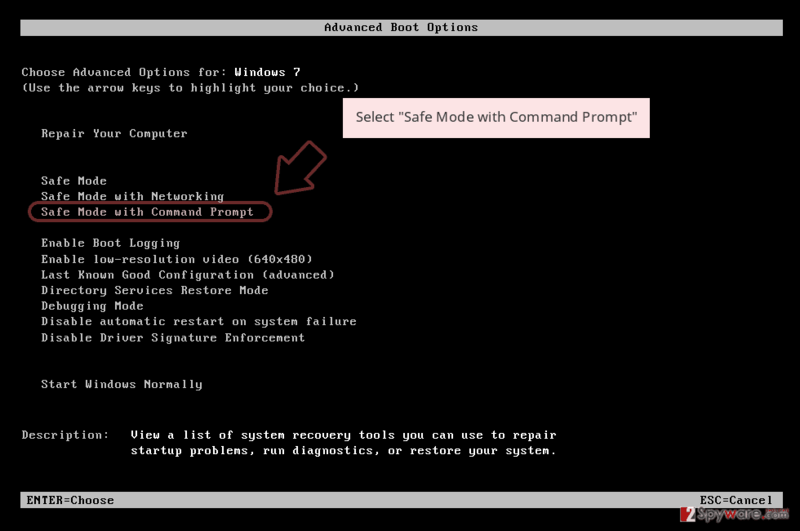 You should run a full system scan with Reimage or similar anti-malware software to remove Skype virus. The most popular form of Skype virus is spoofed links to well-known websites that are sent from compromised accounts. One of the versions of Skype virus is known for spreading spam message saying “this is a very nice photo of you” which is followed by a link. Once clicked, particular malware is dropped on the system. However, several users from other countries reported about getting the same message in their native language. Therefore, language barrier does not prevent the virus from spreading around the globe. In 2016, numerous Skype accounts were hacked and spread links to Baidu.com, LinkedIn.com, and other popular websites. 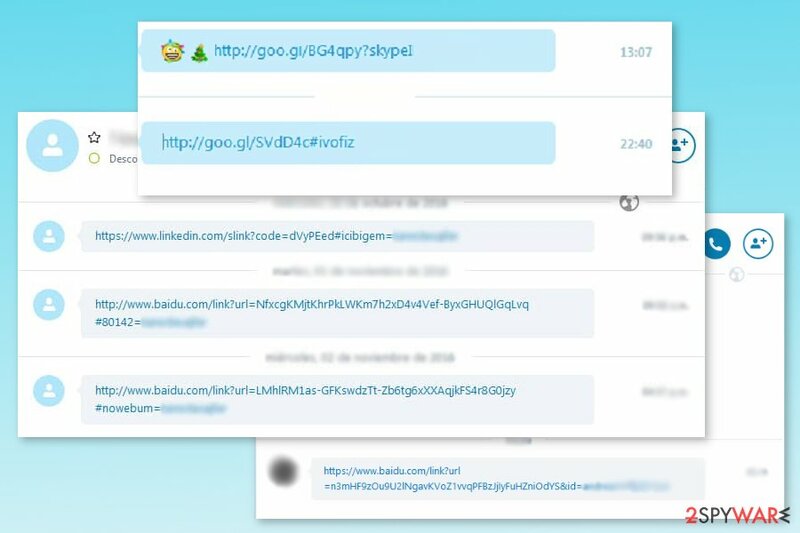 One of the most active Skype virus spam campaigns uses infected user’s account to distribute a malicious Baidu.com link which redirects to the shady Forbes rip-off site Coolinfovip(dot)com . You should be aware of links directing to shady Baidu link. At the end of the link, the name of a Skype contact recipient is appended. If you click on this link, your device might be infected with a severe virus, and all your contacts will receive the link automatically. According to the latest news, Baidu virus uses multiple fake domains to display the fake Forbes website. Apart from the previously mentioned Coolinfovip, the virus can also redirect to 2016forbesnews-f.net. This link is automatically sent to all users on the infected account owner's contact lists. The cycle is likely to repeat itself when the link is clicked on some other computer. That's why you should never leave this virus on your machine and remove Skype virus as soon as possible. Additionally, Skype malware was noticed spreading malicious Google links which are typically shortened. Therefore, you should not click aun unknown link that starts with http://goo.gl/. Simarly, users reported about fake bit.ly links spam. 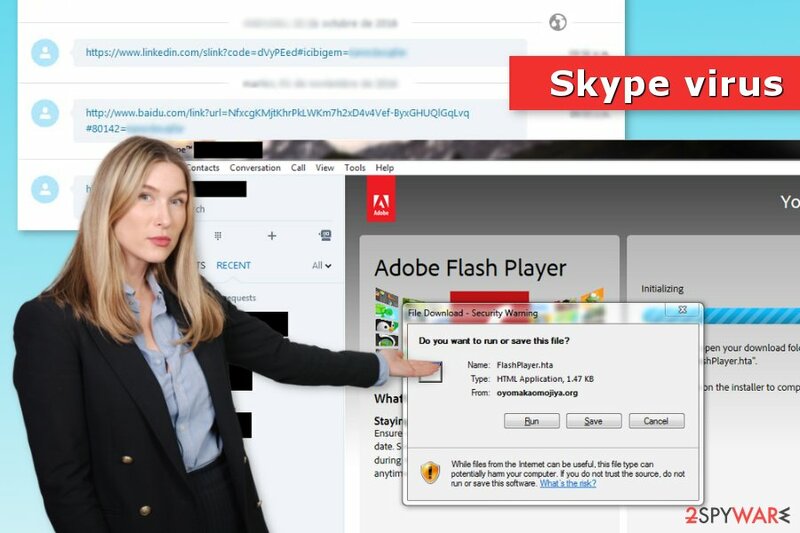 In April 2017, Skype users were hit by malvertising campaign that urged to download fake Adobe Flash Player update. People received this alert every time they logged into their accounts. Thus, there’s no surprise that many users were ticked. As you can already understand, Skype virus has many different shapes and forms. However, it’s still possible to recognize phishing attempts. All you have to do is to be attentive, careful and critical. All these features will stop you from spontaneous clicks or downloads. Ignore all the silly messages from your friends, like “lol is this your new profile pic?”, “This is a very nice photo of you” and similar. Most importantly, do NOT click on the links that are incorporated to such messages or arrive on their own. Do not download funnypicture.jpg.exe, FlashPlayer.hta or other suspicious files that might be presented as Skype components or content received from your friend. Ask your contacts for confirmation if they have actually sent link or file to you. 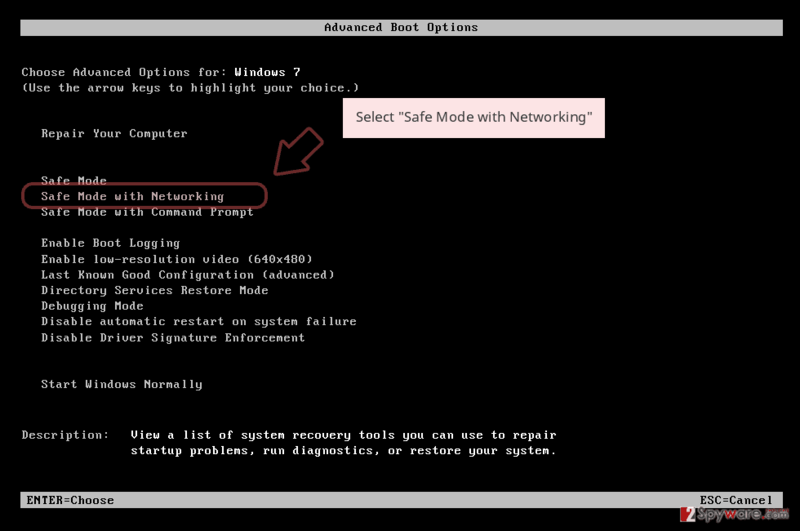 Windows OS users should combine Skype account with Microsoft account if they haven’t done it already. According to the computer, this makes your account more secure and recovery of the account easier. 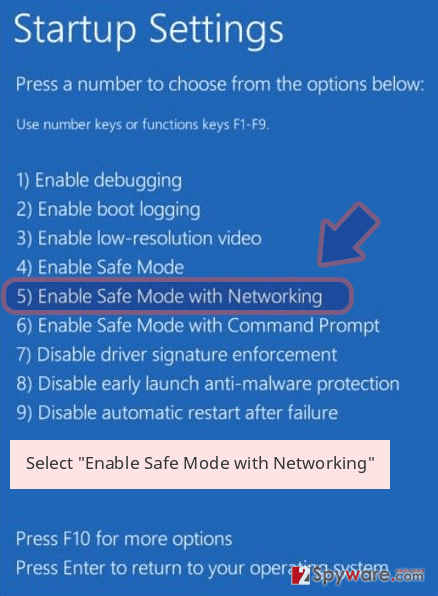 Set up two-step verification on your Microsoft account once you connect it with Skype account. If you can't connect to your Skype account normally, you can be infected with Skype virus. As you must have already understood, it is a seriously dangerous program/issue that can lead you to the loss of your private information. Besides, it can make your computer useless by misusing its resources. For Skype virus removal, you need to install reliable anti-spyware from professional developers. We highly recommend Reimage or Malwarebytes MalwarebytesCombo Cleaner. Cracked or pirated programs may not only be useless but also cause system instabilities, making your computer more vulnerable and prone to malware infections. Go to https://account.microsoft.com and log in using your Microsoft account details. Navigate to Security and Privacy. Under Account Security option click on More security settings. Under Sign-in preferences, you have to choose Change sign-in preferences. When in Change sign-in preferences uncheck Skype name and press Save. Go to www.skype.com and log in with your Skype username. Click on Settings and preferences / Change password. If the problem of fake messages sent to each of your contacts is still bothering you, we recommend contacting Skype customer service. Log in to your infected account and start the browser. Download Reimage or other legitimate anti-spyware program. Update it before a full system scan and remove malicious files that belong to your ransomware and complete Skype removal. 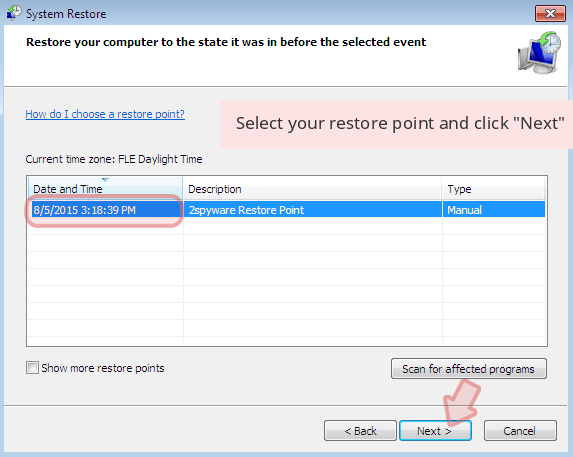 When a new window shows up, click Next and select your restore point that is prior the infiltration of Skype. After doing that, click Next. 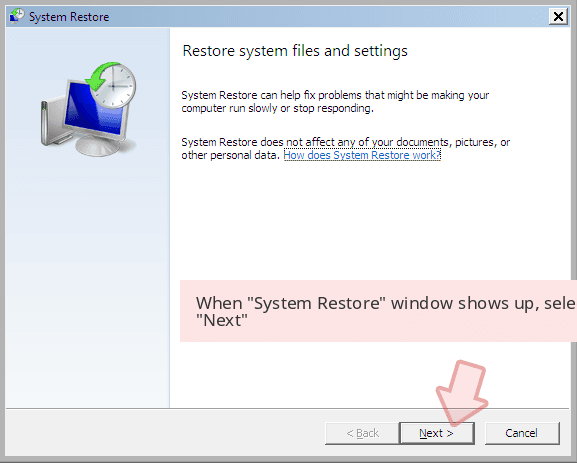 Once you restore your system to a previous date, download and scan your computer with Reimage and make sure that Skype removal is performed successfully. ^ David Perry. Bitcoin-Mining Malware Spreads Through Skype. Bitcoin Magazine. Source of news, insight, reviews, guides, and price analysis on bitcoin, ethereum, blockchain technology, cryptocurrencies, the darkweb, and other decentralized technologies. ^ Treye Green. Facebook Accounts Face Continued Threat From Koobface Virus. International Business Times. Business, Technology, Politics. ^ Tom Warren. Why are Skype accounts getting hacked so easily?. The Verge. Daily and World News. ^ Rene Millman. 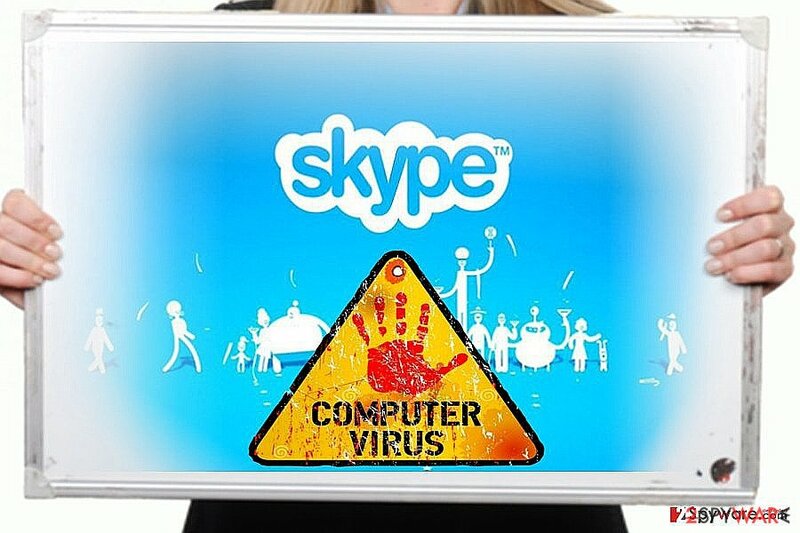 Skype spam malware 'recruits your PC for a botnet'. IT Pro. Ana. ^ Anmol Sachdeva. Skype becomes target of spam Baidu and Linkedin links, reinforces need to secure account. The Tech Portal. Technology News and Reviews. ^ Jenny Kirkham. How to stay safe from online criminals as cyber crime offences increase by 1,266%. Visiter. Southport News, Southport FC,, Sport nad What's On. ^ What should I do if spam messages or links are sent from my account?. Skype Support. The official website. This entry was posted on 2019-04-01 at 00:14 and is filed under Malware, Viruses. How did you remove Skype virus?